Whenever I come across an inspiring technique tutorial or a project idea, I save it to one of my Pinterest boards. Those pins become handy when there’s a need for getting the creative juices flowing, but even if the creative mojo is not lost I love to browse through the idea boards for getting fresh innovative ideas. Some of the pinned projects have been on my to-do list for a while already, waiting for the right time slot to be explored. Like a watercolor portrait tutorial by Elise Engh in her Grow Creative blog that I pinned years ago: I loved the project idea and I had planned to make these cool monotone portraits of my kids, but I was not sure if I had the patience for following all the tutorial steps of editing, printing, tracing, and painting. So, when I finally decided to give it a try, I altered the steps, cut some corners, and finished in no time at all! I used a photo editing program for creating my painting template, and instead of making the painting completely monotonous I used two matching Walnut ink colors for painting. And I loved how the portrait turned out! Creating the painting template requires some photo editing skills, but you don’t need to be an expert for making the template. You can use whichever software you wish, but as photo editing software vary, I did not include detailed instructions of the photo editing steps. However, please do leave a comment if more guidance is needed. Walnut inks come in several natural earth tones, and they give a beautiful antique finish to photos, papers, and wooden embellishments. 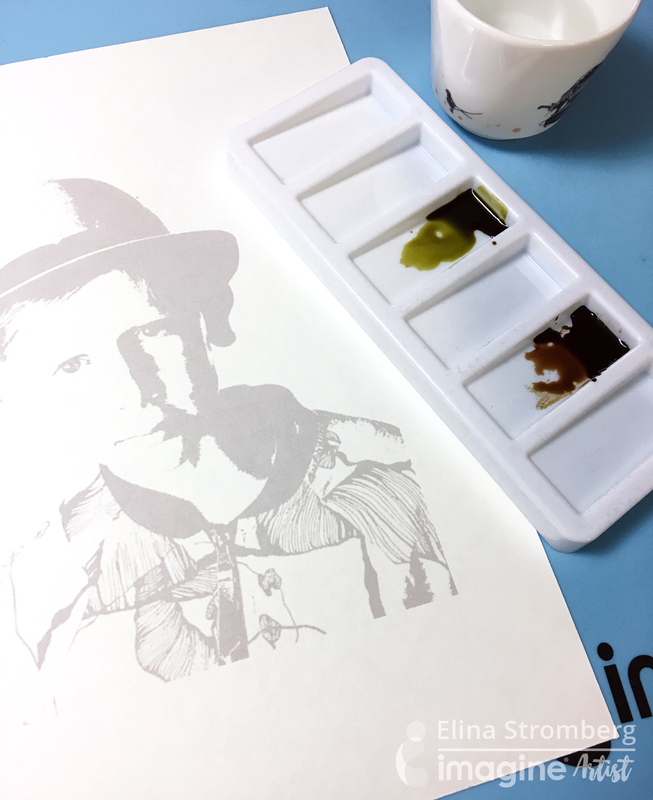 They come in handy spray bottles, but the strong pigment inks can also be used as liquid watercolors; they were the perfect choice for this portrait project! Choose a well-lit portrait photo and open it in a photo editing program (e.g. Photoshop, Photoshop Elements, Gimp, PicMonkey). Adjust colors and lightning, and if needed, add contrast. Convert the photo to black and white, and remove the background. Edit the photo using ‘Posterize’ adjustment tool. Set levels to 2, i.e. use only two colors on the posterized photo. Once done, lighten the black to a light grey so that when you print it is just a light shadow. 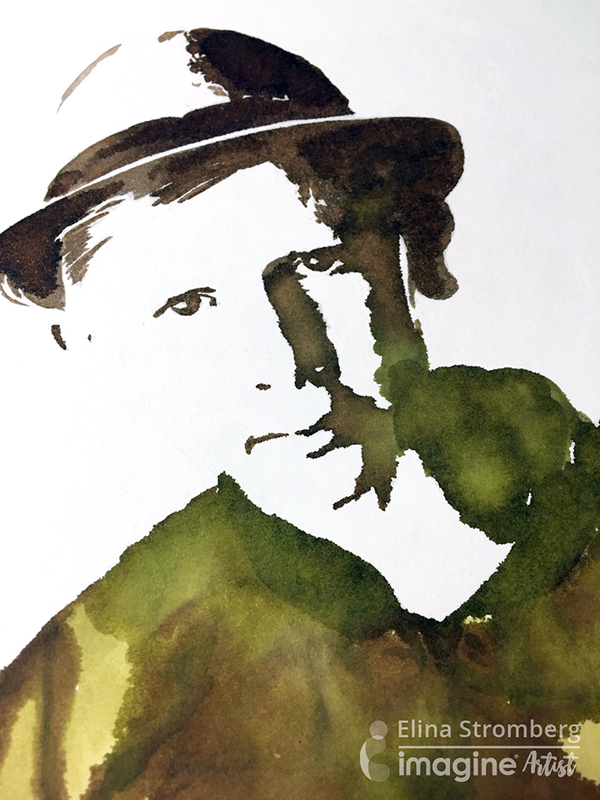 Pour a small amount of Walnut Ink in Brown and Eucalyptus (an earthy green) on a watercolor palette. Taping the paper on the surface is not needed as the Walnut ink will not curl the paper. Paint the portrait using a small brush, covering all printed light grey areas. Let the colors mix, and add water for gaining lighter tints. Work rather quickly, using a rich amount of ink. Walnut Ink will dry quite fast on a porous watercolor paper. When finished, trim the portrait to the desired size and frame. 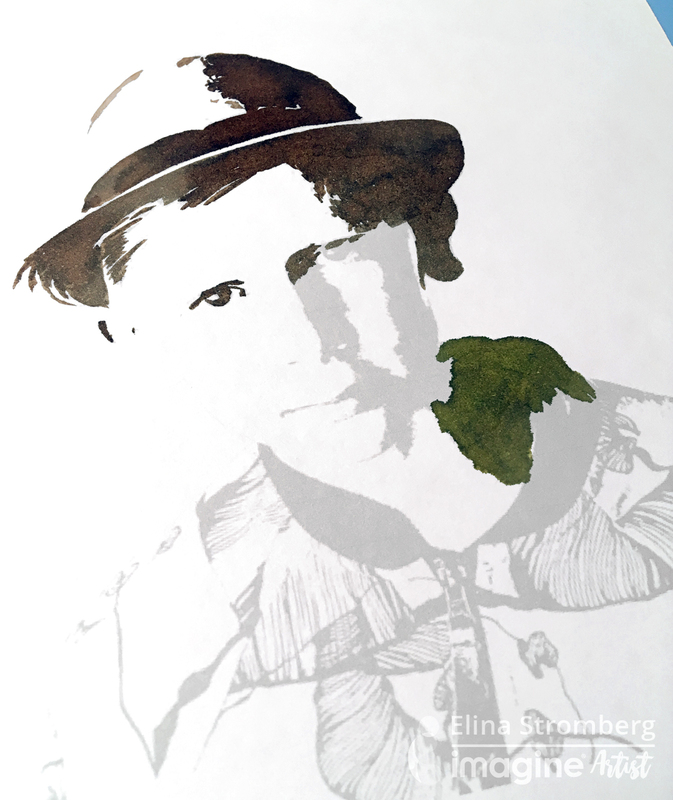 This entry was posted in 2018 ARTIST IN RESIDENCE, Advanced, DIFFICULTY LEVEL, DIY, Elina Stromberg, Home Decor, INSPIRATION, PROJECTS, Techniques, Tools and tagged DIY, DIY Inspiration, INSPIRATION, painting, Paper, Paper Crafting, Photo editing software, Walnut Ink, watercoloring. Bookmark the permalink. It is a simple yet amazing idea!!! Thanks for sharing!! This is really cool idea. Love how it turned.